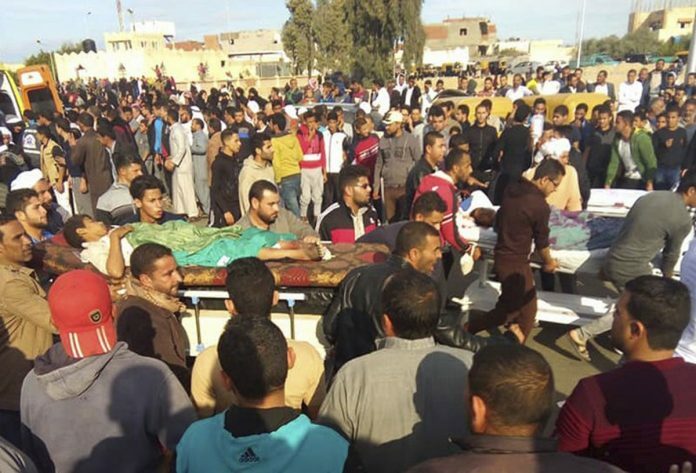 Egypt on Saturday said an attack on a mosque by militants in the country’s troubled region of northern Sinai has killed 305 worshippers, including 27 children, a dramatic increase in the death toll previously announced, which was 235. A statement by the country’s chief prosecutor, Nabil Sadeq, said the attack Friday left another 128 people wounded. It said the attackers, estimated at between 25 and 30, arrived at the mosque close to the small town of Bir al-Abd in five all-terrain vehicles and positioned themselves at the main door and the facility’s 12 windows before opening fire. They also torched seven cars parked outside the mosque, which belonged to worshippers inside. The chief prosecutor’s statement was the most detailed by authorities on the attack, the deadliest by Islamic extremists in Egypt’s modern history. The account it gave generally agreed with what witnesses told The Associated Press on Saturday in the Suez Canal city of Ismailia, where some of the wounded are hospitalized. One witness, Ebid Salem Mansour, said the imam had barely made it atop the mosque pulpit to deliver the sermon when intense gunfire rang out. “We knew that the mosque was under attack by (militants),” he said, recounting an attack that constitutes a grim milestone in Egypt’s brutal fight against increasingly emboldened militants. Friday’s attack targeted a mosque frequented by Sufis, members of a mystic movement within Islam. Islamic militants, including the local affiliate of the Islamic State group, consider Sufis heretics because of their less literal interpretations of the faith. President Abdel-Fattah el-Sissi vowed that the attack “will not go unpunished” and that Egypt would persevere with its war on terrorism. But he did not specify what new steps might be taken. On Saturday, he ordered that a mausoleum be built in memory of the victims of Friday’s attack. The militants, according to another witness, said worshippers began to jump out of windows as soon as the militants opened fire. “The small door that leads to the corridor for the wash rooms was about the only one where worshippers rushed to escape,” said a 38-year-old government employee who did not want to be named for fear of retaliation. Last year, the militants beheaded a leading local Sufi religious figure, the blind sheikh Suleiman Abu Heraz, and posted photos of the killing online. Islamic State group propaganda often denounces Sufis. In the January edition of an IS online magazine, a figure purporting to be a high level official in the Sinai affiliate of the group vowed to target Sufis, accusing them of idolatry and heretical “innovation” in religion and warning that the group will “not permit (their) presence” in Sinai or Egypt. The Latest on the Militant Attack on Sinai Mosque. The attack targeted a mosque frequented by Sufis, members of Islam’s mystical movement.